Giedrė Kazlauskaitė, *1980 in Kėdainiai, Litauen. Sie studierte litauische Sprache und Literatur an der Universität von Vilnius. Giedrė Kazlauskaitė, *1980 in Kėdainiai, Lithuania. Studied Lithuanian language and literature at Vilnius University. She worked in a bookstore, at magazines, newspapers, National Television and Radio and published reviews and essays. Editor of Šiaurės Atėnai magazine since 2010. Latest books: Meninos, poems, Vilnius 2014, Singerstraum, poems, Vilnius 2016. 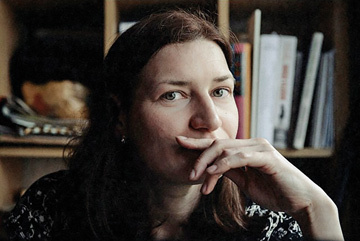 For Kazlauskaitė, her queerness is associated with an indeterminate state of identity and her place in literature and the world. She devotes a considerable amount of attention to questions surroundingw a woman’s place in culture and literature. Schnecken auf dem Pfad: einige von Autos und Fahrrädern zerquetscht. schiebe sie in eine andere Richtung, mische mich ins Karma ein. ich krallte mich daran fest, noch bevor ich zu leben begann. Die Erbsen habe ich gezählt, aber nicht ganz bis zum Ende. Wie die Fliederblüten in der Erde: sie. kein Streicheln (auch gegen den Strich) mit Achillesfersen. langsam, auf einem alten Telefon, und das hilft beim Totschlagen der Sinnlosigkeit. Musik der ganz besonderen Art – die kann es gar nicht geben. oder das erhabene eines Asketen führen. der fruchtlosen Einsamkeit des Internets. Köstlichkeiten, die ich mir nicht leisten konnte. Ich habe kein Nasenbluten mehr vom Blasen der Flöten. erscheint wie ein Überfall auf das Eigentum. ich warte nicht, bis der Frühling tapfer angeritten kommt. und das Wasser flutet meine Seele. Sraigės ant tako: kai kurias sutraiškė mašinos ir dviračiai. į kurią įsikniaubdavau dar nepradėjus gyventi. Tarsi ievų žiedlapiai žemėje: jie. glostymo (ir prieš plauką), batų Achilo kulnais. lėtai, senoviniam telefone, ir tai padeda užmušt beprasmybę. muzikos kaži kokios – jos iš viso gali nebūti. Nebeperku knygų, apie kurias taip svajojau; gardumynų, kurių neįpirkdavau. Kraujas iš nosies nebeteka niekad nuo fleitų pūtimo. irgi atrodo gviešimasis į nuosavybę. nelaukiu, kad drąsiai atjotų pavasaris. ir vanduo mano sielą aplieja. Snails on the road: some smashed by cars and bicycles. I used to hold on to it before I was born. I used to count the dots, but did not finish counting. Like acacia petals they are in the ground: they. Stroking (including against fur), shoes with Achilles’ heels. some type of music- I can do without it altogether. Interesting people, live like a fancy hetaera or a noble ascetic. to the meaningless Internet isolation. I no longer buy those books, that I was dreaming about; delicacies that I could not afford to buy. I no longer get nosebleeds from playing the flute. will take place: knowing and understanding also seems like a breach of privacy. don’t wait for the boldly arriving spring. and water is washing over my soul.